Top the headband with a cute, feminine bow. If you're tired of wearing ponytails and just can't get a hair bun to look right, try whisking your hair back with a bandana. This versatile hair accessory comes in a variety of colors and prints, making it an affordable go-to, daily hair accessory. 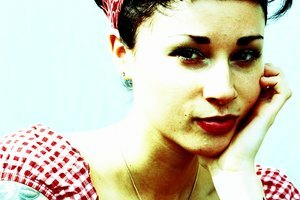 Luckily, tying a square bandana into a fashionable headband -- a-la pin-up girl style -- takes just a few minutes. Spread a square bandana out on a flat surface. Smooth the wrinkles with your fingers. Fold one corner of the cloth so the point touches the center of the bandana. Fold the diagonally opposite corner of the cloth into the center of the bandana so that the two corners touch. Halve the bandana by folding it lengthwise, to create a narrower piece of fabric. Lift your hair up and place the bandana around your neck so that the ends hang over your collarbone in the front. Hoist the two pointed ends of the bandana straight up, just behind your ears, above the crown of your head. Tie a simple knot and tighten it until secure. Shift the bow of the bandana slightly to the right for an off-center, cute look. Choose a larger scarf if you need the bandana to wrap over a bump of teased hair at the crown of your head. New bandanas are often too stiff to fold easily. Wash the bandana on a delicate cycle with fabric softener to loosen the fabric. Tague, Angela. "How to Tie a Bandana on the Top of Your Head." Synonym, https://classroom.synonym.com/tie-bandana-top-head-10691.html. Accessed 23 April 2019.